Is It Still KO’s For Life? It wasn’t the slug fest some anticipated, but more of a fistic chess match between players with adverse styles. The styles of each fighter (Thurman, Garcia) distinct, along with the intentions of each fighter (boxing from the outside vs. aggressive pursuit), many of the rounds were up for debate even to the well trained eye. 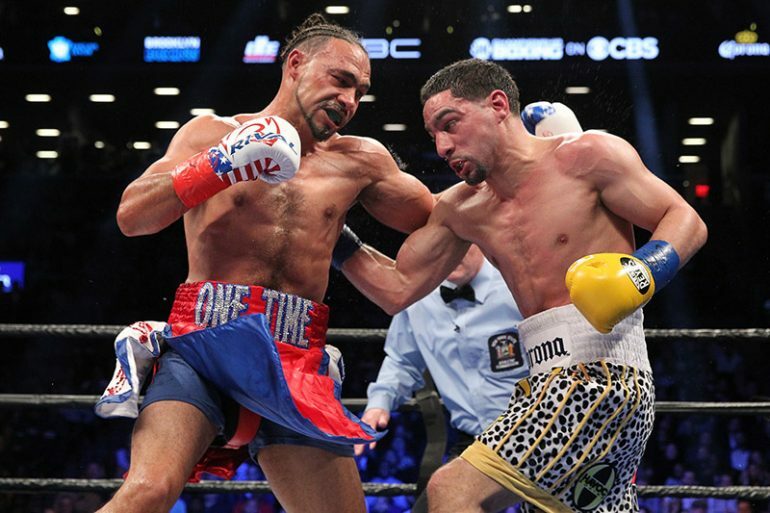 While it does not appear to be “KO’s for life” for the newly unified WBA and WBC welterweight champion Keith Thurman 28-0 (22 KO’s), he displayed impressive skills in victory over Danny Garcia 33-1 (19 KO’s). Viewers of the Premier Boxing Champions on CBS did not witness a knockout in the main event, however, prospect turned contender Erickson Lubin 18-0 (13 KO’s) scored a sensational KO en route to his victory over Jorge Cota 25-2 (22 KO’s). The PBC knocked the competition ratings wise leading their time slot. Regarding Thurman, although he did not score the knockout he wanted and there may be discussion regarding how rounds were scored or interpreted, the fact remains he is still undefeated. While boasting an impressive KO percentage of 76%, 22 stoppages in 28 fights, Thurman has not scored a KO since 2013. “KO’s for life, okay. I’ma put you to sleep all day, every day. If not, I’m going to sleep because I come to fight. I come to hurt you or get hurt,” stated Thurman. Why the recent decline of KO’s for Keith? The lack of knock outs may be due to the technique; Thurman does not fully thrust his weight, thrust his hips into all of his punches so he can score the knockout. It’s more so arm punches; flashy punches with great speed and accuracy, but not always with enough power to knock someone out. Thurman’s punches however are situational. Depends on the opponent, varies on what Thurman is trying to do from a strategic standpoint. Against Garcia, Thurman was trying to box from the outside and tally up points. It’s difficult to sit down and place weight with punches when constantly moving. This is a case of strategy and victory over obtaining a knockout. Knockouts are harder to come by when facing elite level opposition. Pacquiao hasn’t scored a KO since 2009 and he’s heralded for his punching power right? When stepping up in class, in most cases, the fights are against boxers with better defensive skills and greater chins. It hurts the sport when the art is not properly diagnosed and analyzed; when there isn’t an explanation from the commentators as to what the viewer is watching, there may be confusion. Paulie Malignaggi’s presence was missed. Some of the older heads of the sport who are so dismissive of the newer generation of fighters do not do the sport any favors. N when he said, the winner is, I thought he was gonna say, "the fans, for getting their money back" !!! Many writers and media personalities criticizing the fighters and the fights at every whim, motivated by hidden agendas is not helping matters. ESPN barely touched on this fight leading up to Saturday. The well show First Take, featuring a self-proclaimed boxing fan Stephen A. Smith and longtime boxing analyst Max Kellerman hardly touched on this fight. There were only three fights in history of the sport featuring two undefeated welterweight champions unifying the titles prior to Thurman vs. Garcia. Two boxers in their primes and who are pound for pound quality fighters. How is the sport supposed to return to glory days, when media personalities in a position of power hardly talk about the sport in a positive light? Perhaps the criticism of this fight particularly stems from Thurman’s proclamation of seeking knockouts and destruction. While that sounds great in theory, it’s not realistic for the reasons aforementioned. Especially if Thurman can’t knockout or knockdown the smaller man; Garcia spent most of his amateur and professional career at 140 lbs. In spite of these criticisms, Thurman displayed all of the qualities of p4p fighter this past Saturday. Elusive lateral movement, pristine jabbing, speed, combination punching and most important high level boxing IQ. Instead of living by the mantra “KO’s for life,” Thurman may want to switch up to – victories by any means necessary.